The first SESE-built space instrument is off on a journey to survey an asteroid and help scientists bring back rock and soil samples from it. In the distance, silence. Then a tiny puff of white smoke appears, followed by a small, bright light at its center. Immediately a white pencil-shaped object — a rocket — begins a straight-up climb, riding on a golden spark. Still no noise from the rocket. Thirty seconds later comes a loud, hard-knuckle rumble from kerosene and liquid oxygen exploding in controlled fire in the rocket's engines. Solid-fuel boosters strapped onto the rocket for extra lift are firing also, leaving a prominent white trail of smoke as the Atlas V rocket climbs ever higher. 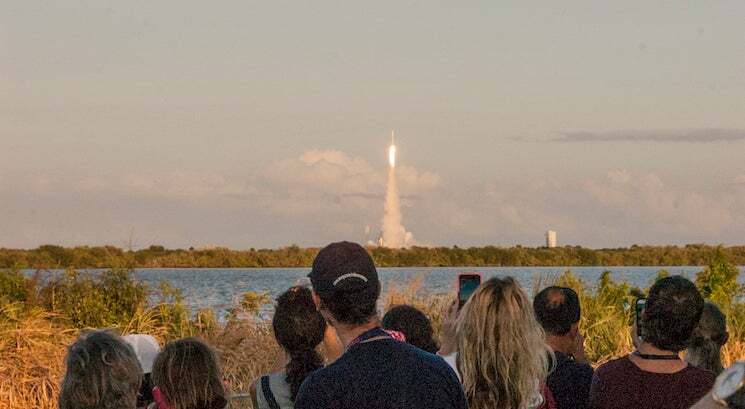 Less than a minute after the rocket's roar first arrives, it is diminishing as the rocket's accelerating trajectory bends eastward from the Kennedy Space Center's Pad 41 in Florida. The trajectory turn carries the rocket away from the land, out over the Atlantic Ocean, and soon away from Earth itself. The Atlas rocket, with a Centaur upper stage for added kick, is carrying NASA's OSIRIS-REx spacecraft — and a mineral-scouting, temperature-sensing camera from Arizona State University. "This is the sixth instrument I've sent into space, and the thrill never leaves you," says Philip Christensen. He is Regents' Professor of geological sciences in the School of Earth and Space Exploration (SESE). Christensen is the principal investigator for the OSIRIS-REx Thermal Emission Spectrometer (OTES). This places him at the head of a team of 40-plus engineers, technicians, scientists, and graduate students who built OTES from scratch. "OTES is the first complex space instrument to be designed and built entirely at ASU," Christensen says. His previous instruments have all gone to Mars on NASA orbiters and landers. But while designed by him, they were built by aerospace contactors. "This is like our first-born is leaving home," he says. OTES is one of five instruments on NASA's OSIRIS-REx mission. OSIRIS-REx stands for Origins, Spectral Interpretation, Resource Identification, Security, Regolith Explorer. The mission is led by the University of Arizona in Tucson, and it is the third mission in NASA's New Frontiers solar-system exploration program. The flight plan calls for the OSIRIS-REx spacecraft to rendezvous with the primitive asteroid 101955 Bennu in August 2018. Over a period of some 500 days, the spacecraft will use its suite of instruments to identify the best place to sample. After the sample is collected and stowed away in a re-entry capsule, OSIRIS-REx will leave Bennu in 2019, maneuver back toward Earth, and use the capsule to deliver the sample to a landing site in Utah in September 2023. Then after diverting past Earth, the spacecraft will go into orbit around the Sun. Scientists chose asteroid Bennu as the target for the mission because it has undergone relatively little change since it formed early in the solar system's history. Samples from it could improve our understanding of the origin of Earth's water and organics — both essential to life as we know it. And they may give us a better look at how the solar system formed. With an orbit that brings it within comes within 450,000 kilometers (280,000 miles) of Earth, Bennu is the most accessible asteroid rich in organic materials. It is about 500 meters (1,600 feet) wide, roughly spherical and spins once every 4.3 hours. Reflecting only 3 percent of the sunlight falling on it, Bennu is about as dark as a charcoal briquette. It's also an asteroid with a high probability of hitting Earth — there's about one chance in 2,700 for an impact in the 22nd century. OTES plays several key roles in the mission to Bennu. One task is to use long-wavelength infrared light to identify and map the asteroid's minerals, which will help mission scientists choose the sampling site. A second task is determining the surface temperature and heat emission from all parts of Bennu at all times of day on the asteroid. This is to help scientists gauge the strength of the Yarkovsky effect on Bennu. The Yarkovsky effect is a weak but steady thrust produced by sunlight when it falls on a spinning object. The effect arises from the fact that sunlit ground is warmer in the afternoon than the same ground is in the morning, because sunlight has had more time to heat it. This means that the afternoon side of a rotating object in space radiates more heat than the morning side, thus producing an extremely small thrust. For objects as massive as planets, the effect is negligible. But for small bodies like Bennu the effect could change its orbit. OSIRIS-REx will help scientists assess how fast Bennu's orbit is changing and gather information useful for future generations, which may have to take action to deflect the asteroid. But that task lies in the future, as OSIRIS-REx has just started its journey to Bennu. "We can’t wait to get our first glimpse of Bennu with OTES," says Christensen. "It will be really fun to observe something so different and primitive."